Corky Lee, a self-taught photographer, has been documenting the vibrant and fast-emerging Asian and Pacific American community for over 30 years. 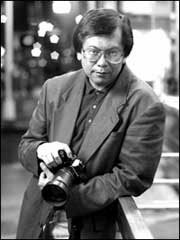 Known as the “undisputed unofficial Asian American Photographer Laureate,” the ubiquitous Corky has covered the day to day lives of Asian Pacific Americans as well as historical moments in American history. Mr. Lee was set on his photojournalistic course in junior high school by a famous photograph taken at Promontory Point, Utah, in 1869. The picture commemorated the completion of the transcontinental railroad and showed workers posing with two trains, one from the Central Pacific and one from the Union Pacific. But something was wrong with this picture. No Chinese workers. Since Mr. Lee first laid eyes on that photograph, he has devoted himself to making Asian Pacific Americans visible. At once intensely personal and socially conscious, Corky’s self-styled photojournalism crosses the divides of different Asian nationalities, and presents a rich picture of Asian Pacific Islander Americans adjusting and finding their place in America. As a photojournalist imbued with an unyielding passion for community activism, Corky has challenged stereotypes by offering diverse images from the often invisible and excluded Asian Pacific American communities. His work, which has been described as “only a small attempt to rectify omissions in our history text books,” has appeared in Time magazine, The New York Times, The Village Voice, Associated Press, The Villager, and Downtown Express, as well as exhibitions throughout the United States, including Boston, San Francisco, Honolulu, and Denver. On college campuses, his photographs have been exhibited at Cornell, Columbia, Harvard, Princeton, and John Jay College of Criminal Justice in New York City. Corky contends that he owes much of his success to the Asian American press, notably A Magazine, Filipinas Magazine, and Koream Journal in addition to the following newspapers: AsianWeek, Asian New Yorker, NY Nichibei, Rafu Shimpo, International Examiner and Hawaii Herald. Born and raised in Queens, N.Y., Lee is a second-generation Chinese American and the eldest child of a “paper son” laundryman and a seamstress. Mr. Lee is a graduate of Queens College and lives in Queens.